While considered science fiction a decade earlier, semi-autonomous and autonomous vehicle technologies are evolving rapidly. The prospect of autonomous driving seemed to be impossible and futuristic. The idea of autonomous vehicles is not new and traces back to the times of Leonardo Da Vinci who first sketched a three-wheeled driverless cart in 1478. Tesla’s autopilot was introduced in 2015 with driver assistance systems, which marked the inception of semi-autonomous vehicles, paving the way for autonomous vehicles. Nevertheless, significant technological advancements accomplished by companies like Google’s Waymo and Tesla have made it a reality. These companies are anticipated to debut their vehicles that will take our hands off the steering wheels. The degree of automation in vehicles has augmented progressively over the past few years. Today’s most innovative systems can take over driving during a traffic jam - as long as the driver’s hands are on the wheel. Increased safety and security concerns have boosted the customers’ demand for semi-autonomous and autonomous vehicle technologies. Minimal vehicle accidents, improved fuel efficiency, and engine productivity are some of the potential benefits of semi-autonomous and autonomous vehicles. Significant decline in price, like in the case of LIDAR (price dropped from $75,000 to $7,500), is anticipated to reinforce the market growth. Since the inception, the acceptance level of such technologies in different regions differ. The economically advanced countries have already embraced semi-autonomous and autonomous technologies such as Adaptive Cruise Control (ACC), Blind Spot Detection (BSD), Adaptive Front Lights (AFL), Lane Keep Assist (LKA), and Intelligent Park Assist (IPA) as standards to mitigate accident risks up to 90%. Semi-autonomous: Vehicles that require minimum human intervention and utilise advanced driver assist technologies, such as ACC, LKA, IPA, and AFL, to reduce the effort required to manoeuvre the vehicle. Autonomous: Vehicles that are capable of manoeuvring without a human operator. Up to Level 3 the vehicle falls under the purview of semi-autonomous technology. Level 4 vehicles require minimal human intervention for operating the vehicle; whereas, Level 5 vehicles require zero human intervention. 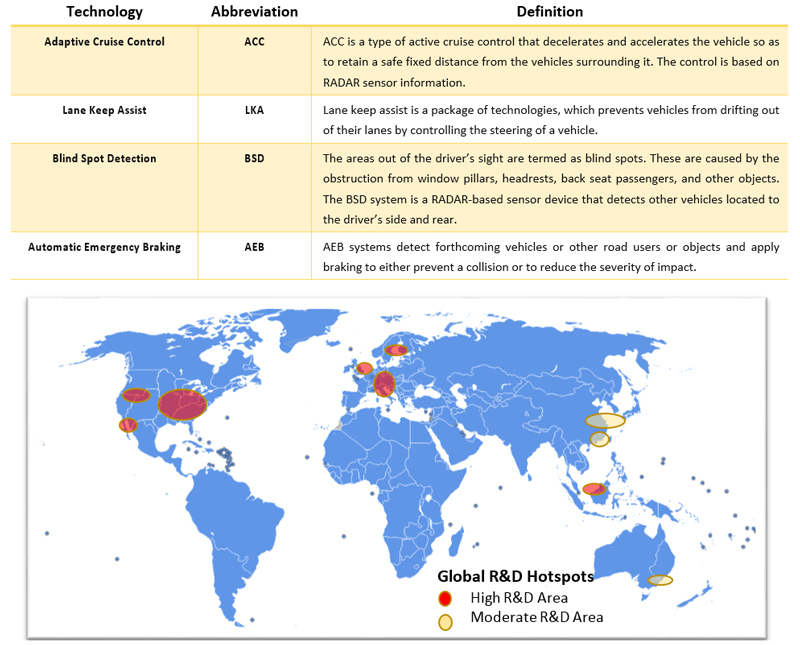 The growing awareness towards safety and security concerns in North America and Europe has fueled the demand for driver assist technologies (ACC, BSD, AFL, and LKA), which in turn has led to the increased integration of such technologies in vehicles. Semi-autonomous and autonomous vehicle technologies will revolutionise the world with fewer vehicles on the roads, which means less pollution. Autonomous driving and the related technologies will grow in tandem with the development of smart cities that support autonomous driving. By 2018, couple of driver assist technologies are expected to be standardised, whereas EBS is already standardised by the EU legislation on new vehicles. Car crashes have been reduced up to 15% in the cars that have forward collision warning systems and automatic braking features. Integration and collaboration of all such technologies in vehicles is anticipated to mitigate the human driving effort, which in turn will reduce accidents by almost 40% (NHTSA, 2017). Sophisticated autonomous vehicles are estimated to have one-tenth of the probability to be involved in an accident than does a car operated only by a person. Sophisticated artificial intelligence and advanced intuitive human–machine interface (HMI) will support the evolutionary roadmap for autonomous vehicles, which are anticipated to perform eventually better than human-driven vehicles. Present logistics schemes could be spun upside down as autonomous vehicles will eradicate certain constrictions for commercial vehicles, such as driving-hour limits, leading to higher asset deployment and better productivity. Europe and North America are the hubs for automotive OEMs with some of the premium car manufacturers like Audi, VW, Daimler, BMW, Mercedes-Benz, Bentley Motors, Maserati, GM, Ford, Fiat, RAM, Dodge, Chrysler, Ferrari, Lamborghini, Seat, and Bugatti Automobiles having their headquarters there. Commercialisation of semi-autonomous and autonomous technologies requires intensive testing that attracts substantial capital investment for research and development. The semi-autonomous and autonomous vehicles market growth is predominantly driven by technological innovation leading to a paradigm shift in the way vehicles are driven. Big data, which defines the increasing amount of data available, collected, stored, analysed, and monetised, and the autonomous vehicles make a perfect match. Autonomous vehicles will create and communicate with significant amount of information on location, speed, etc. - some of it being personal, thereby increasing the concern of privacy and cybersecurity issues. Autonomous driving can be rightly termed as a disruptive technology because of the disruption caused by its inception in insurance, telecommunication, logistics, and similar other industries. This technology will create additional job opportunities in the automotive industry, which shall reflect in GDP growth. Overall, technology firms will have the most to gain from the development and deployment of autonomous driving technology. The savings due to this technology in the trucking/freight industry is estimated to be in the range of $90–490bn per year. The bulk of the savings shall arise from the eradication of the wages of truck drivers. The maximum impact in the auto industry due to the shift to autonomous driving is arguably on the OEMs. The OEMs that have the most dependable and feature-rich autonomous capabilities will be the ones that shall retain their market shares. The lately emerging autonomous driving value chain, which includes component suppliers, automakers, software providers, infrastructure suppliers, data processors, and service providers such as insurers and promoters, involves many companies that are currently in separate business fields. The race towards the implementation and commercialisation of autonomous driving will necessitate the deployment of regulatory framework to offset the occurrence of any hazardous event. With respect to legislative framework deployment, as much as 33 states in the US have introduced legislations governing the operation of autonomous driving. Although, for fully autonomous vehicles, legislative framework needs to clarify whether the owner will be vicariously liable and under which circumstances. Companies such as Ford, Mercedes, VW, and Tesla are competing to build autonomous vehicles for a profoundly changing consumer world. Ford, for example, lately tripled its investment in its autonomous vehicle fleet and is testing a fleet of autonomous Ford Fusion hybrids in California, Michigan, and Arizona. The fingerprints of tech history can be realised in almost every aspect of their exciting new capabilities. Rapid advancements in the autonomous driving technology has raised the question of suitable operational models for futuristic autonomous driving. The key determinant in the viability of such models is the competitiveness of their cost structures. Post comprehensive analysis of the respective cost structures, it is inferred that public transport shall remain economically competitive; although shared or pooled vehicles service demand more efficiently. A multitude of transport services are conceivable with autonomous driving, yet the picture still remains turbid as to which service shall prevail. Perhaps, the most exhilarating part of the autonomous driving saga is the cooperation among private industry, government, and academia, which have already begun to flood autonomous vehicles into our lives. The collaboration between these entities shall entail failsafe deployment of autonomous driving.